I’m originally from Middlebury and went to Northridge High School, but we were always connected to Goshen as a family. We went to church here in Goshen, and my parents went to Goshen College, and we had a lot of friends here. However, it wasn’t until I went to Goshen College that I really connected with Goshen as a community. Right now, I stay at home with Lewis, our son. I was working at Lacasa, Inc. until June 2018 when I quit to be at home with him. I still teach some financial literacy classes there. On the side, we’re also part of a farm. It was my grandparents’ farm in Shipshewana, and now it’s a joint family venture. It was a dairy farm until August of last year when we made the decision to sell the herd. We’re transitioning all of our farm to organic. We spend a lot of time with family and friends in Goshen. We like to be outside. There are so many trails and things and spaces you can go and walk around. The public spaces like the millrace – we like that a lot. All that space between the river and the millrace is really nice. We really appreciate the Goshen Farmers Market. We like to buy as much stuff locally as we can. I’ve always found that to be a neat place. My wife and I were Peace Corps volunteers and we got back in 2016. You’re with a group of people who are also volunteers, and you get to know them pretty well. Most of them came from the east or west costs, kind of urban areas. 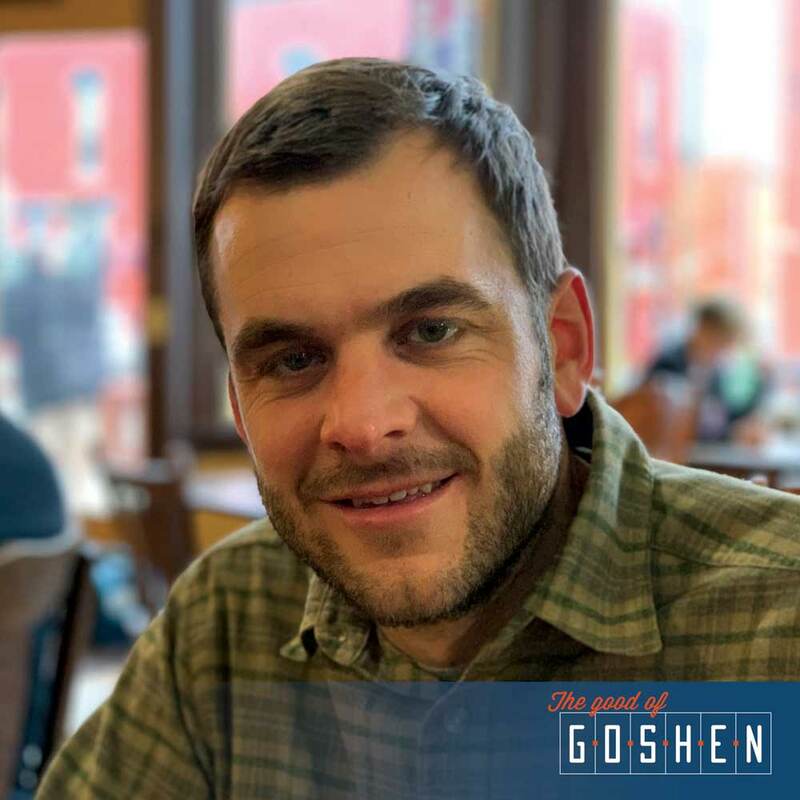 So we found ourselves talking a lot, actually, about Goshen and just being like, “Goshen has a lot of cool things going on that people don’t imagine as going on in Indiana.” It’s just not the conception people have of Indiana from outside. There’s a community here that seems like it values the things that Goshen has. They want to shop locally and they want to buy food locally and they want to support all the good things that Goshen has going on. It’s just got a community feel, and a lot of people who support it.